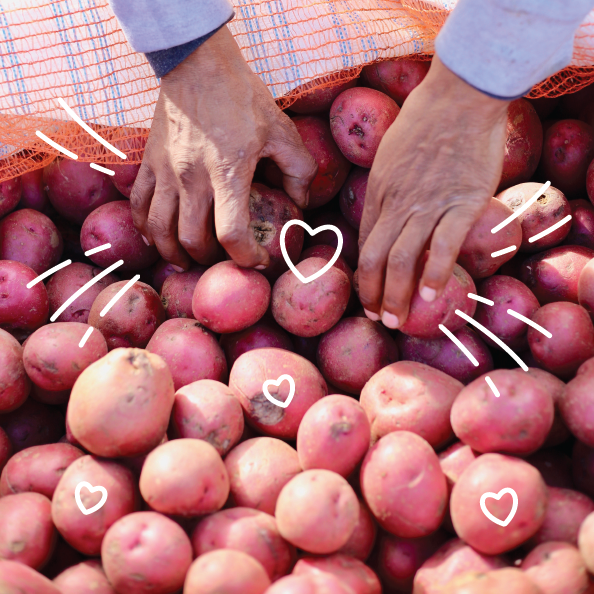 Though Imperfect Produce is a venture-backed startup based in San Francisco, we are also a mission-driven organization that is attempting to do a pretty rare thing in Silicon Valley: do well by doing good in the world. Three years and seven cities after we started as a local, scrappy startup in Emeryville, California, we have expanded nationally and changed a lot, which comes with plenty of growing pains and opportunities to answer thoughtful but challenging questions. To eliminate food waste in the world and build a better food system for everyone. Our society is throwing away 165 billion dollars in food every year, while one in six Americans goes hungry. At the root of the problem of food waste is not supply, but distribution. According to NRDC's 2017 report on food waste (page 14), 20 billion pounds of fresh produce go to waste on farms each year. How much produce do food banks recover from farms? While there is no official number, we can get pretty close and it looks like it’s around 1-2% of this 20 billion pounds. Here’s the breakdown of those stats based on the best data available right now. Nationwide, Feeding America reported that in 2017, they received over 1.47 billion pounds of produce from all of their sources including grocery stores, distributors, and farms. They clarified to Imperfect that produce sourced from farms makes up approximately 10% of this 1.47 billion pounds, so roughly 147 million pounds. This 147 million pounds is the closest national figure available, but some food banks aren’t in Feeding America’s network so the total number is likely larger. Another useful data point is that in California, where one third of our country's vegetables and two thirds of our fruits are grown (according to the California Department of Agriculture), food banks recovered 164 million pounds of produce in 2017. Most of this volume went to Feeding America food banks, so there’s a good amount of overlap in the produce counted in this California figure and in the national Feeding America figure. Our best estimate from this would be that food banks and other non-profits recovered roughly 200 to 400 million pounds of produce from farms in 2017. While this is a tremendous impact, there is another 20 billion left behind, so 50 to 100 times what’s currently recovered by food banks. Food waste and hunger are inextricably linked, and there’s no way to eliminate hunger without also addressing food waste. The NRDC reports that recovering less than one-third of the food we currently throw out would be enough to feed every American that is food insecure. Simply put, there is thankfully more than enough produce around to feed everyone, including via food banks. The issue is getting it into the hands of people who want and need it while it’s still fresh. Our co-founders came to know the problem of food waste early in their lives when, as college students fed up with the amount of food going to waste at their school cafeterias, they started the nonprofit Food Recovery Network. The concept was simple: use student volunteers to transport unsold food and donate it to food banks and meal sites in the community. Over the course of more than three years, they were able to get students at 150 universities involved in the effort. Our hearts will always align with the mission of eliminating food waste and increasing access to it. We’ve recovered more than 30 million pounds of food, meaning that all of the water, land, and labor that went into growing this produce went towards a nourishing purpose, instead of going to waste. We’ve donated over half a million pounds of produce to our food bank partners across the country, helping make healthy food more accessible for more people. Additionally, we operate a weekly Free Farmers Market at our San Francisco headquarters, which is located in a food desert, where we distribute surplus produce to our wonderful neighbors. But our mission isn’t just the elimination of food waste in the world. It’s also to build a better food system for everyone, which includes our customers, food banks, our employees, and farmers. This requires achieving a scale of impact that goes beyond one city, one region, or one state. We choose to solve this problem through a market-based solution. While there are certainly a number of ways to address food waste and hunger, we think that this is a meaningful way to do it at scale, generate value, and solve an economic and environmental problem, all while rewarding farmers for their full harvest. In addition to wasted land, water, and fertilizer, any crop farmers leave in the field represents lost revenue. And while we love and respect small, local farmers, we made a conscious choice to source from medium and large-scale growers and coops early-on because this would enable us to make a bigger impact on food waste, deliver produce to more cities, and connect folks with healthy fruits and vegetables year round. Connecting farmers with this new market for their produce, in turn, means we are able to offer our subscribers healthy produce for up to 30 percent less, on average, than grocery store prices. On top of this, we offer an additional discount for anyone participating in government food assistance programs, to ensure everyone has access to fresh and healthy food. Every full-time Imperfect employee, whether a delivery driver or senior executive, has an equity stake in the company. We offer health, dental, and vision benefits to every full-time employee, whether salaried or hourly. We’re committed to paying our hourly employees at the 75th percentile of the local pay average, and in some places, we pay double the local minimum wage. All of our business decisions have enabled us to make a big impact on a huge social and environmental problem while feeding more people for less money. While many are at work addressing these issues in a variety of important ways, Imperfect is our way of making a difference. We believe that our business model is proving to be an effective alternative to leaving billions of pounds of produce unpicked in the field simply because retail chains don’t want to buy curvy carrots or scarred lemons. Food waste is a colossal issue. We do not have all the answers, but we do know that the world needs efforts of all shapes and sizes. We need businesses to work together with the government, nonprofits, local CSAs, schools, and individuals to care in new ways. We wake up every day rededicated to playing our part. We deeply appreciate your support during our first three years and we remain committed to supporting the unique part you play. Together, we can make the world a better, healthier, kinder, and more sustainable place—for all of us.